Grown for its fleshy, succulent berries. Hermaphrodite - pollinated by insects. 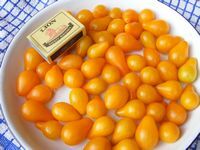 Grape tomato with bright, golden-orange fruits. Need support with canes, strings or a frame. Can grow in a container. Savory vegetable or flavoring in cooked food. Freezed/ juiced/ dried and ground into a powder - flavoring and thickening agent in soups, breads, pancakes. Pulped fruit - skin-wash for an oily skin. Sliced fruits - first-aid treatment for burns/ scalds /sunburn. Skin of tomato fruit is a good source of lycopine - protect people from heart attacks/ treat an enlarged prostate and the difficulties in urination that accompanies it. To obtain lycopine - it seems to be more effective when cooked. Pulp of the fruit is used cosmetically in face-packs. The strong aroma of the tomato plant is said to repel insects from nearby plants. A spray made from the tomato leaves is an effective but very poisonous insecticide. Very effective against ants - use with great caution as it will kill beneficial insects as well. If ingested by humans - is toxic as well. Take care to only spray it on the ground to repel ants. Grow with French marigolds to deter white fly. Grow well with basils, parsley, alliums, nasturtiums, asparagus, gooseberries and stinging nettles.